Bicycle Regulator by Pawel Danielewicz -- also has tons of useful links! Standlight circuits (Will this circuit work?) thread on CPF, with lots of good info from Alex W.
LED Center -- good LED tutorials, info, news, calculators, etc. Explanation of a Diode Bridge Rectifier from Wikipedia -- this component is useful when driving LEDs from a dynohub. 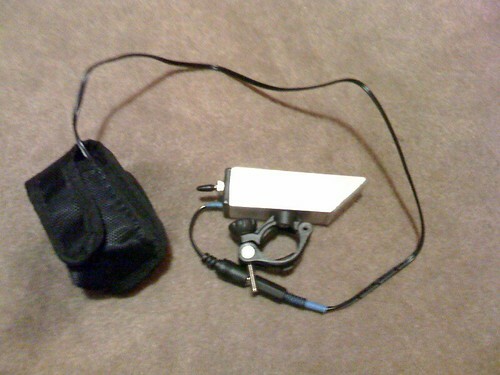 I'd like to build a light similar to the Dinotte 3w (single emitter powered by 4-AA NiMH battery). I think I can clone this light (using a Cree XR-E for better output) for around the same cost as the Dinotte, or slightly less. Or, I'd like to build a two-LED version of the Dinotte. I'd like to keep the battery pack constrained to 8-AA 2500mAh NiMH cells -- either configured in series for 9.6V or in two parallel sets of 4-AA each for 4.8V; this is to keep battery costs low, to leverage existing NiMH cells and chargers I already have, to keep the battery lightweight and compact, and to allow easy battery changes as cell-technology improves. Motor Heatsink for Light Housing? Source for Aluminum Tubing, etc. Dual Cree XR-E Light -- Finished! 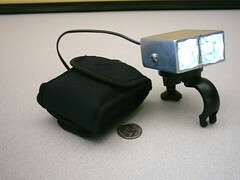 This is a simple, single-LED, dynohub-powered bike headlamp. Inspiration came from Circuit #2 @ Pilom.com and also largely from Znomit's Downunder Dynamo Dinotte. The housing consists of a 3" length of 1" square aluminum tubing, sourced from my local hardware store. A square piece of plexiglas (also found at the hardware store) is glued on the business end with some clear silicon sealant. The other end is closed by a square plastic 1" endcap (hardware store again), which also locates the on/off switch and power cord. The optic and LED are from DealExtreme. The LED is mounted on an L-shaped heatsink made from two halves of the square-section tubing, glued together with AAA thermal adhesive. The capacitor and diodes forming the simple driver circuit were salvaged from a dead stereo receiver. I had the toggle switch laying around. 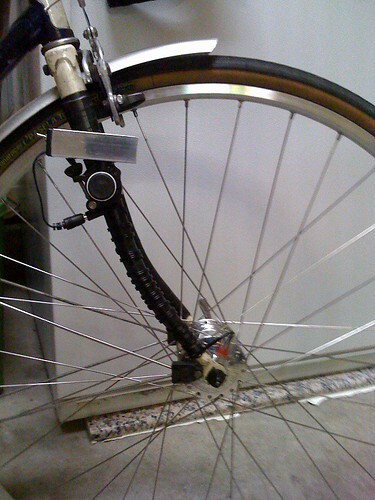 The handlebar clamp was borrowed from an old set of Vistalite bike lights. The whole thing is held together by a single M5 bolt. This light was built using a similar design to the dynamo-powered light. The main difference is that this version is battery-powered, so a driver board is incorporated. I modified the design of the heatsink slightly as well -- since the driver will run the LED at higher current than the dynohub version, I wanted to beef up the thermal mass a bit so I went with a solid aluminum slug (this was cut from a chunk of aluminum I had on hand). 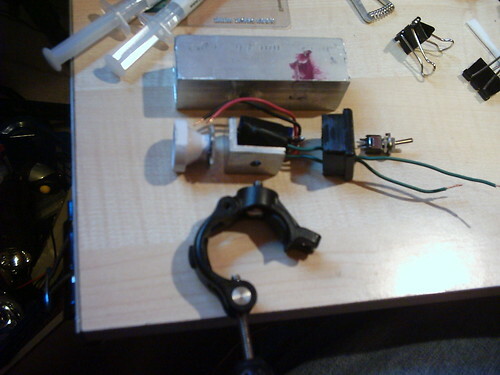 Again, the toggle switch used in this light was something I had on hand. I cut the front of the housing off at a 45-degree angle to create a hood over the optic to try to focus the beam downwards and block the glare from oncoming traffic. Inspiration for this light came largely from the DIY Dinotte thread at MTBR.com. One of the most difficult aspects of DIY LED bike lights is sourcing all the components required! There is no one single vendor through which all the parts can purchased, so you have to hunt around the web and your local hardware stores to find what you need. One of my goals in building these two simple lights was to try to purchase everything needed from as few stores as possible. If I build more of these lights (and I might), I want to keep the sources for parts as convenient as possible. I think I succeeded -- I used only three sources for the components: The power jack and cord and 4xAA battery clip came from Allelectronics.com (also a great source for capacitors, diodes, single-component bridge rectifiers, switches, misc wire, and other odd small parts like cell phone cases for battery packs); the LEDs, optics, and driver boards came from Dealextreme; the square aluminum tubing and plexiglass came from a local hardware store. The handlebar clamps were repurposed from an old Vistalite set, and while you could certainly buy a ready-made clamp from Cateye or elsewhere, I feel that those are somewhat overpriced. The original Dinotte light design uses a simple rubber o-ring to fasten the light onto a bike's handlebars, and that works great if that's where you like to position your head lamp. I am working on a cheap and easy-to-make bar clamp design that I think will offer a little more flexibility in mounting these lights -- more details on that as I make progress. The design features include a stand light, switchable dual-mode operation (1x or 3x LEDs), an anti-glare "brim" to block some of the upward throw of the beam, and a remote switch box for easy control while riding. I mainly built this to use up the quad optic I bought a few years back. The housing is made from some 1x1" square section aluminum tubing, some U-channel aluminum extrusion, and some 1x0.125" flat aluminum bar JB-Welded together. The square tubing houses a bridge rectifier, a 1F 5.5V supercap for some basic standlight functionality, and a DPDT center-off toggle which switches between two or four LEDs.